In the men’s race, there is a clear favorite: Wisconsin’s Ollie Hoare, the Australian who won last the NCAA 1500 title last June and has been the best miler in the country this year. 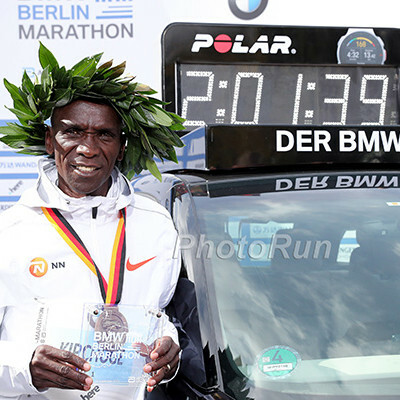 But the women’s race is completely wide-open. The top seed is Hannah Meier, a 24-year-old sixth-year senior from Michigan who until January hadn’t run a mile PR in almost six years. 2017 champ Karisa Nelson of Samford is back as well after missing almost all of 2018 after breaking her foot falling down some stairs. We have no idea who is going to win, which should make for a dramatic final on Saturday. Clearly, Wisconsin’s Ollie Hoare is the man to beat here. He was a surprising NCAA champion in the 1500 outdoors, upsetting three-time NCAA champ Josh Kerr of New Mexico. 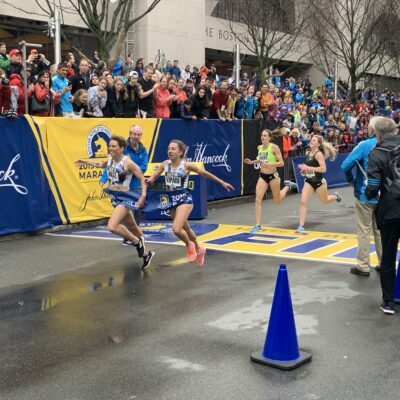 But with Kerr turning pro, Hoare entered 2019 as the mile favorite and has so far lived up to the billing. He’s won all three of his individual races this season, highlighted by an NCAA-leading 3:54.83 mile at Millrose, which puts him #9 on the all-time collegiate list and almost two seconds ahead of his closest rival this year, SEC champ Waleed Suliman of Ole Miss. 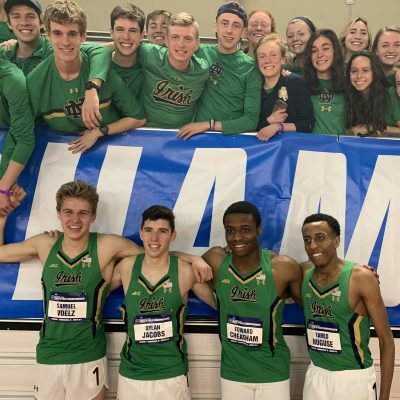 The only time Hoare showed any sign of weakness came in the DMR at Notre Dame on February 16, when he was outkicked on the anchor leg by ND’s Yared Nuguse. 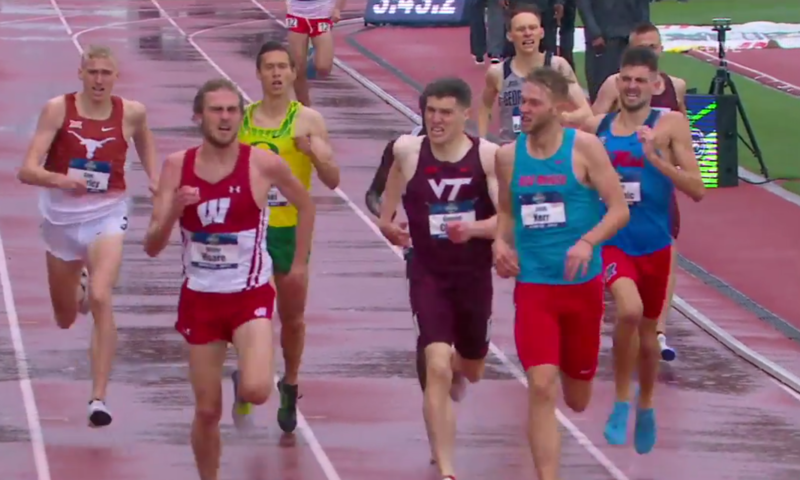 But Hoare still split 3:55.8 in that race and Wisconsin ran 9:26.24, the third-fastest NCAA time ever. And with Nuguse opting to run only the DMR at NCAAs, Hoare’s biggest competition will be sitting in the stands during the mile final. Hoare will likely be anchoring the DMR on Friday night as well, which means he could be tired for Saturday’s mile final, but everyone in the race will have at least one race in their legs from the night before anyway. We’re not too concerned about fatigue. 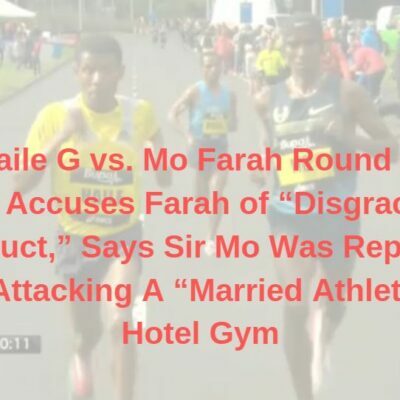 Should Hoare falter, it’s anyone’s race. Only two men return from last year’s mile final: Southern Utah’s Kasey Knevelbaard (5th) and Oregon’s Reed Brown (8th). And only three men are back from the 1500 final outdoors: Hoare (1st), Texas’ Sam Worley (5th), and Washington’s Mick Stanovsek (12th). 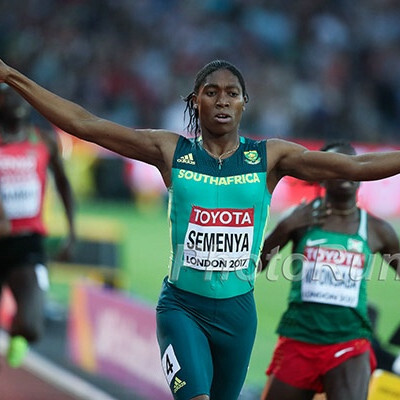 Suliman has the second-fastest time in the field, though it came on the speedway known as the Boston University track. But he’s also the only guy in the field, other than Hoare, who has not lost to a collegian in an individual race 2019. If Hoare is beaten, he may be the best bet to do it, though he may also have DMR duty on Friday. LRC prediction: We’re not going to overthink this. Hoare FTW. Who will win the 2019 NCAA indoor men's mile final? 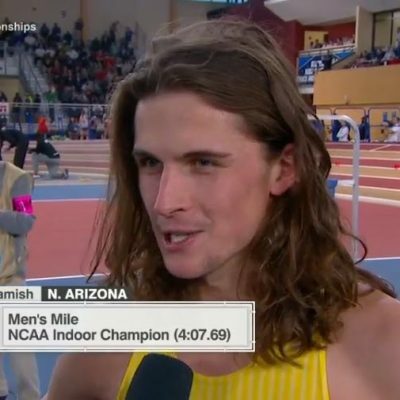 The two best milers in the NCAA will not be running the mile at NCAA indoors. Last year’s runner-up, Dani Jones of Colorado — who went on to finish 5th at USAs in the 1500 and win the NCAA XC title last fall — is redshirting. NCAA 1500 champion Jessica Hull of Oregon is opting for the DMR/3k double at NCAAs. You could actually make the case that the three best milers in the NCAA won’t be running because the 2019 collegiate leader, Danae Rivers of Penn State, has opted to run the 800 instead. In fact, only one of the 12 women who contested last spring’s NCAA 1500 final will be running the mile at NCAA indoors: Portland’s Taryn Rawlings, who finished 6th in Eugene last June. That leaves Michigan’s Hannah Meier, a 24-year-old sixth-year senior, as the top entrant at 4:32.46. And as you might imagine for a 24-year-old sixth-year senior, Meier has traveled a long road to get to this point. Meier and her twin sister Haley (4:42 HS mile PR) were high school phenoms in Michigan; Hannah was the USA Youth champion in 2011, racked up 11 state titles, and graduated high school with a mile PR of 4:40.48 in 2013. Both Meiers chose to attend Duke, but both transferred after two years in 2015. Hannah had battled a foot injury while at Duke, developing three stress fractures, and even after transferring home to Michigan, she has endured injury struggles. 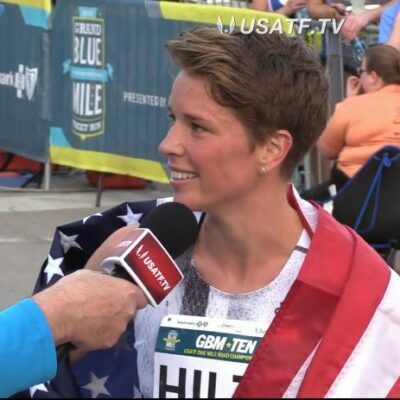 She finally put together a full track campaign in 2018, but finished just 7th (indoors) and 9th (outdoors) in the Big 10 mile/1500 finals (meanwhile sister Haley won the mile indoors and was 2nd in the 1500 outdoors, making NCAAs in both). Outdoors, Hannah went out in the first round at the NCAA East Preliminary round, finishing 9th in her heat. But Meier has built on that season in 2019 and the result has been a long-awaited breakout. In her indoor opener on January 19, she ran 4:40.35 — her first mile PR since high school. She subsequently lowered her PR to 4:34.66 and, finally, 4:32.46 at Big 10s. This weekend, not only will Meier compete in her first NCAA track champs, but she will do so as the top seed. Will Meier’s incredible journey end with an NCAA title? She’s certainly a contender, but there are several other women capable of winning this thing. #2 seed Julia Rizk has a story similar to Meier. An Ohio native, Rizk spent the first two years of her NCAA career at UCLA, and though she made it to outdoor NCAAs in the 800 in 2017, she transferred back home to Ohio State after that season. Last spring, she didn’t even make it out of her prelim at the NCAA East Preliminary round — she and Meier were actually in the same prelim, with Meier finishing 9th and Rizk 10th — but now the two athletes, whose schools are bitter rivals, are the top two seeds at the NCAA championships. At Big 10s, Meier finished .33 ahead of Rizk in the mile. Karisa Nelson will be looking to author her own comeback story. The surprise NCAA champ for Samford two years ago, Nelson broke her foot falling down some stairs in January 2018 and missed six months as a result, costing her the rest of the 2018 track season. 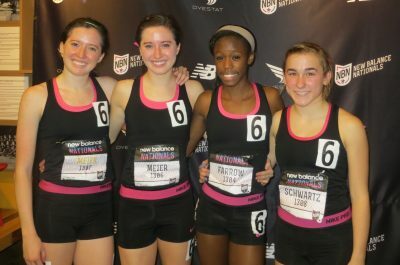 Almost a year later, she finally returned to action, and her 4:34 sb is actually faster than the time she entered NCAAs with two years ago (though she could only run 4:44 at Millrose on February 9). She’ll also be racing on her home track, as Samford’s campus is just a 20-minute drive from the CrossPlex. Katie Rainsberger is another woman who was in great form two years ago (3rd NCAA indoor 3k, 4th NCAA outdoor 1500) but was hampered by injuries last year. Now at Washington after transferring from Oregon, she’s run faster every time out this season, going 4:37-4:36-4:35 in her three mile races. If you’re looking for a newcomer, keep an eye on Arkansas redshirt freshman Lauren Gregory. She ran 4:32 in her first collegiate mile on January 26 and two weeks later, she ran 8:55 for 3000. Her two NCAA appearances in XC have been absolute disasters — 252nd in 2017 and a DNF last year — but perhaps track is more her style. At the SEC champs, she beat teammate Carina Viljoen, the #6 seed in the mile, by nearly two full seconds to win the mile title. LRC prediction: With no obvious favorite, all 16 of the women entered in the mile can realistically dream of becoming NCAA champion. LRC has a soft spot for twins and comeback stories, so we’ll take Meier FTW. Who will win the 2019 NCAA indoor women's mile final?